This is a continuation of the Last Cows of Boynton – Part 1 – click here to read the original post. Hypoluxo Road and Congress Avenue. At the time it was built, there was no Congress Avenue, so when the road was put through in 1965, two cattle paths were built under the road so the cows could get to the milking barn on the west side of Congress without disturbing traffic. That property today is The Meadows development, including the Meadows Square Plaza, where the Melears’s house once stood. Tyler Melear had his dairy on Lawrence Road north of what today is Gateway, C.B. Melear was on Old Boynton, Bill Melear and Charlie Melear were on Boynton West Road (today’s Boynton Beach Boulevard) and operated the Learwood dairy, and Lester Melear was on Lantana Road west of the Turnpike. A sister was even in the business. Nonnie Melear White and her husband Louis White were also on Boynton West road. The Melears milk was distributed through the McArthur, Alfar and Boutwell Dairies. The 1945 Florida Census for Boynton Beach listed several people with the profession of “dairyman” – C.F. Knuth and his son Orville and his Few Acres Dairy at Lawrence and Old Boynton, A.E. 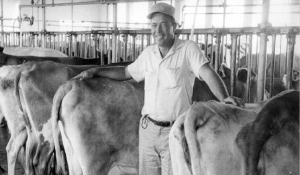 Allen at the Eldorado Dairy, the Winchesters (who also raised pineapple), the Williamson and Goodman Dairy, the Goodwin Dairy, Harry Benson’s Gulf Stream Dairy, Albert Teele, who ran a “milk counter” in the Northwood neighborhood of West Palm Beach, B.L. Tuck on Lawrence Road, and Herbert Keatts and Grover Bell, who had their dairies on the Military Trail. was originally platted in 1927 as the “West Boynton” subdivision. They bought both pieces of land at tax sales. 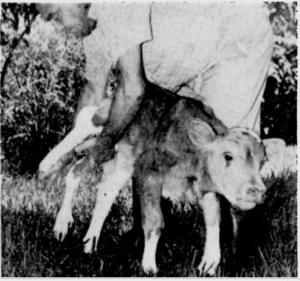 They were featured in the Palm Beach Post in 1960 when a five-legged calf was born at the dairy. The Goolsby children sold the West Boynton subdivision portion in 1977, and the developer simply took the original 1927 plat and sold lots. These are the avenues today called Aladdin, Barkis, Coelebs, Dorit and Edgar. As time went by, the land was becoming more valuable and the profit margin in the dairy business was razor thin. The inflation pressures and oil crisis of the early 1970s were the last blows to both the Weaver dairy in Boynton and the Melear dairy on Congress. Both were closed by 1973. Many of the cow herds were moved to the Okeechobee area to larger operations. 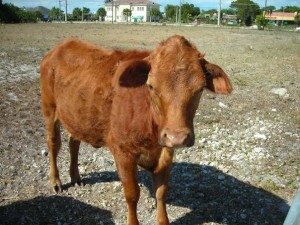 Some cows remained across from the Boynton Beach Mall until about 2005, when the land was sold for the Boynton Commons shopping center. somehow allowed me to believe that I still lived “in the country.” I know that very soon the last ones will too be gone, bringing a whimpering end to almost 100 years of dairying history in Boynton. Take a ride out and visit them while they are still there. We remember it well., although we didn’t get to the Palm Beaches until 1959, Jim and his family are Fort Lauderdale natives, from 1911,so they’ve seen a lot of progress over the years. We don’t live in Florida anymore. Thank you for the excellent articles that you post. Hi Cecil. I remember your family very well. My dad’s name was Willard Lewis. Your brother Loyal and i use to hang out a lot together. I haven’t spoken to him in quite awhile up in Georgia. I need to contact him soon. Hope all is well with you and your family. I remember your dad very well. I also remember your mom as a very beautiful woman and caring mother. Nonie Melear White was my maternal grandmother. I loved all of my Melear great uncles and aunts. There were 13 children altogether. They were hard working and proud people. Wow! I am living here now in North Carolina and reading this article certainly brings back all the old names that I remember from my childhood! I miss hearing those cows at night. Growing up on Mission Hill Road we could still hear them in the distance and certainly smell them driving down Congress Avenue! I am Walter Goolsby’s Great-Grandson. This was a cool article to find. My grandparents Leo and Nadine Sterrett owned the 20 acres across from the Boynton Mall and had cows, hogs and other animals. They sold the property in 1972 or 73, and moved to Alford, Florida in the panhandle. My parents Joe and Frances DeMarco owned DeMarco’s Tractor and Supply and my dad was on the City Council.